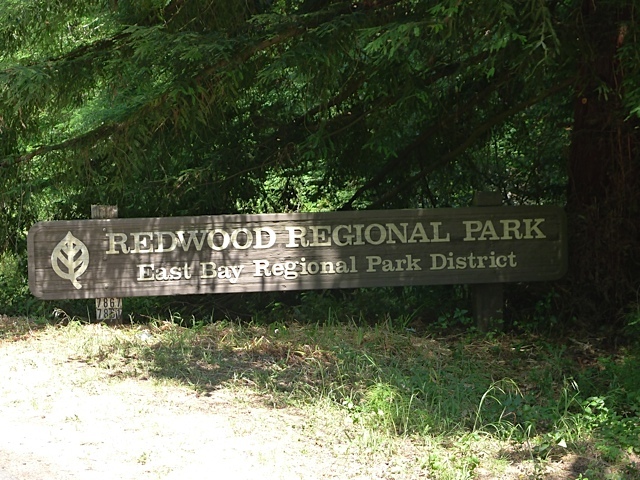 Highlights: Redwood Regional Park is my favorite park in the East Bay, containing the largest remaining natural stand of coast redwood found in the East Bay. This shady loop offers a nice sampler of some of the best sections and trails in the park. 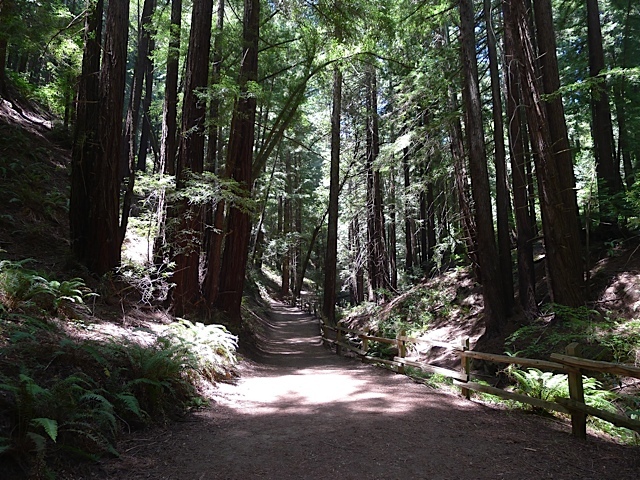 The first half of the hike follows the Stream Trail with majestic redwoods along Redwood Creek. The second half traverses the scenic “uplands” of the park along the popular French Trail. This hike can be done in either direction. Directions: From Moraga take Canyon Road south until reaching Pinehurst. Take a left on Pinehurst and wind over the hill until reaching Redwood Road. Take a right. The park entrance will soon appear on your right. Park in the first parking lot on the left after you see the “Fishway” area and sign. $5 parking fee on weekends. From the Oakland side take Highway 13 to the Carson Street/Redwood Road exit. Go East on Redwood Road for 3.2 miles until reaching the park entrance, passing Skyline Blvd on the way. Turn left into the park. Park in the first parking lot on the left after you see the “Fishway” area and sign. $5 parking fee on weekends. Trailhead: The hike starts at the Fishway area. Special Notes: There is quite a bit of poison oak along the French Trail so be careful or consider wearing long lightweight pants. 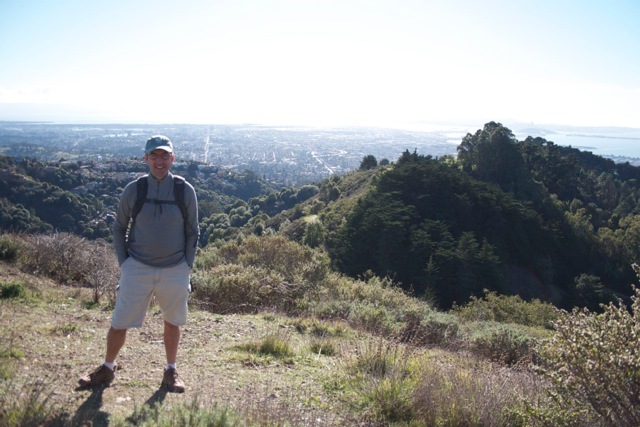 This hike isn’t technically in the Lamorinda area, but I figured I should write a post about it since I recommended it for an article in the Contra Costa Times titled “Bay Area’s best hiking trails” published on Sunday, July 6th, 2014. Before starting your hike take a minute to check out the interpretive signs about Rainbow Trout. 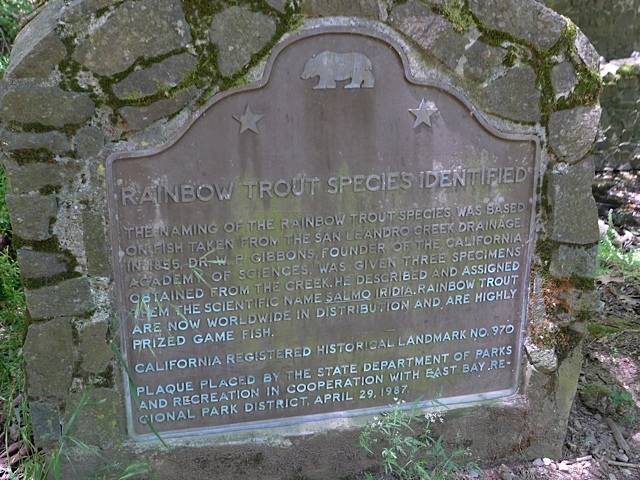 The world-famous rainbow trout were first identified as a distinct species from fish taken from San Leandro Creek drainage, of which Redwood Creek is a tributary. The trout that spawn in Redwood Creek today are descendants of that pure strain of native trout. To start the hike, cross the bridge and take a right on the Bridle Trail. 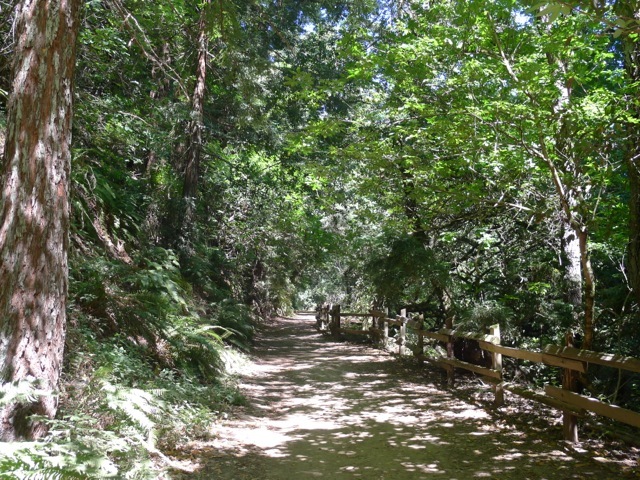 Bridle Trail runs adjacent to Redwood Creek and bypasses the main parking lot and busy picnic areas. After about a half mile you may notice that the second group of redwood trees on the right appears to be in a circle (see picture). This is called a “fairy ring.” Redwoods sprout from the stumps or roots of existing trees. When the original tree dies, the surrounding shoots may develop into mature trees in a circle around the ancient parent. Try to imagine the old growth tree that would have been in the middle of the circle! You’ll reach a connector to the main Stream Trail, but you’ll want to stay left on the Bridle Trail. The trail will climb just a little and you’ll see the Stream Trail down to your right as you hike just above it. At one point there is an unmarked trail heading left, but you’ll want to go right and continue paralleling the Stream Trail. At about 1.5 miles The Bridle Trail will merge into Stream Trail (at the intersection with the Chown Trail). Option for a 4 mile loop: After reaching the Stream Trail, go about a quarter mile and instead of going straight take a left on the Fern Trail, climb to the French Trail, and take a left. This will cut a little over 2 miles from the loop. 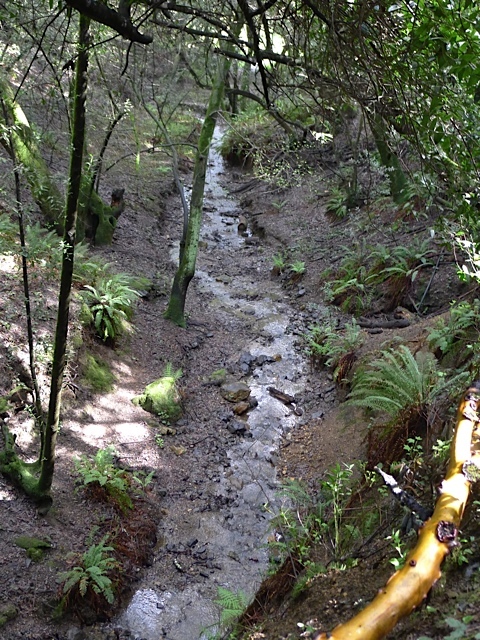 For the full 6.4 mile loop continue on Stream Trail – the “spine” of the park. 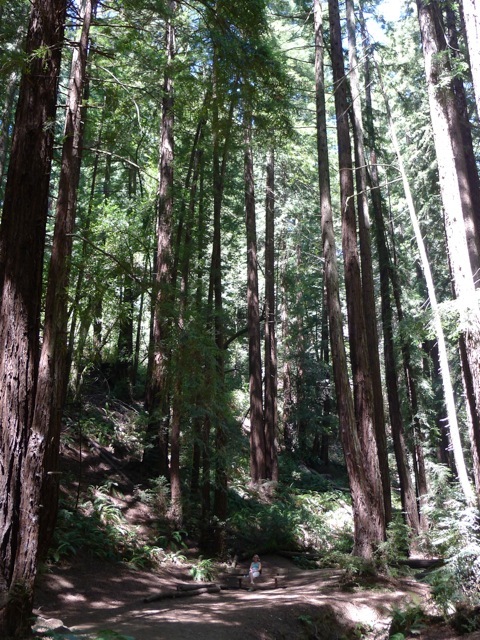 The largest redwoods along the creek are second and third growth descendants from a virgin, old-growth forest, just like Muir Woods, that was completely logged between 1840-1860, then logged again after the 1906 earthquake. So, the tallest trees are only about 100 years old. But that is long enough for many of them to have grown over 100 feet tall! Left undisturbed these amazing trees can live over 1000 years and grow to be over 300 feet tall. At a little over 2.5 miles you’ll reach the intersection with Tres Sendas Trail (translates from Spanish to three paths). This is one of the most scenic spots in the park. 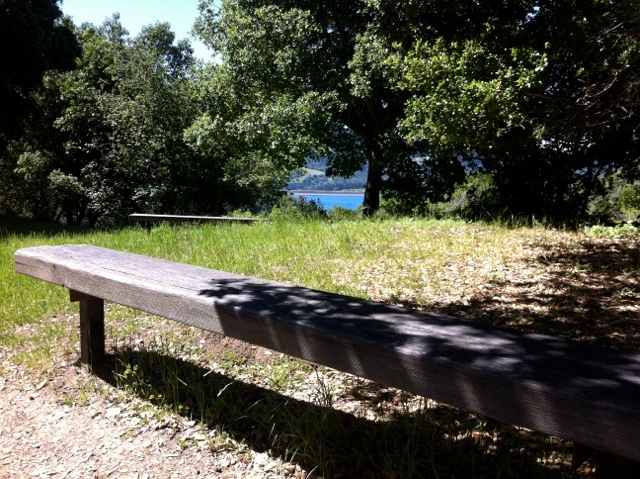 Take a left on Tres Sendas Trail and then take a break at the bench on the right, a perfect place to rest, have a snack, and take in the view. After just a tenth of a mile on the Tres Sendas Trail take a left on Starflower Trail. Get ready for one of the main climbing sections of the hike, but it’s only about a third of a mile. When you reach the French Trail, take a left. The French Trail winds along the western “uplands” of the park back in the direction you came. You’ll continue to see many redwoods, but also many California Bay Laurel trees and a few oak trees in the sunniest spots. When the French Trail intersects with the Chown Trail, make sure to follow the sign pointing left to stay on the French Trail. Along the French Trail and throughout the park, you’ll see ferns everywhere. This is an amazing family of plants. 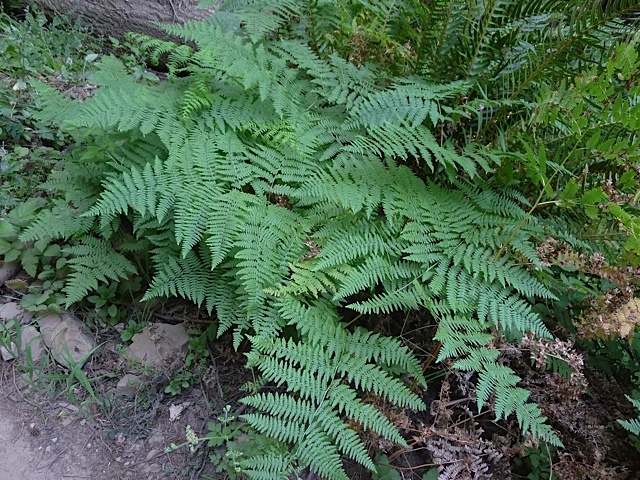 Ferns first appear in the fossil record 360 million years ago and now there are 12,000 different species of ferns. Ferns reproduce via spores and have neither seeds nor flowers. They tend to grow in areas where it is challenging for flowering plants to survive. 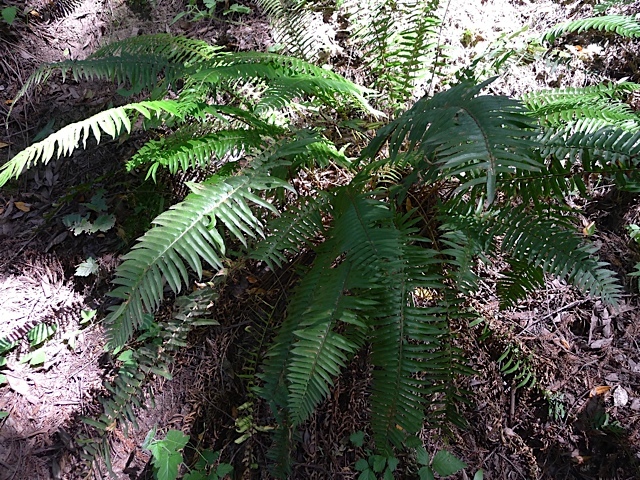 You will see two types of ferns in the park: the western sword fern and the wood fern. See the picture of each type. After about 2.7 miles on the French Trail, you’ll reach Orchard Trail. Take a left, descending back down to the Bridle Trail. Take a right at Bridle Trail and return to the Fishway area. An interesting piece of history: when Alameda County was split off from Contra Costa County in 1853, the border was put right through the center of these redwood lands, because both counties realized the value of the forest and didn’t want to give it up. There are an unlimited number of loops that you can create in Redwood Park. Just grab a map and plan a route from whatever staging area you start from. Dogs: Yes, but must be kept on a leash at all times. This is one of the few EBMUD trails that allows dogs. 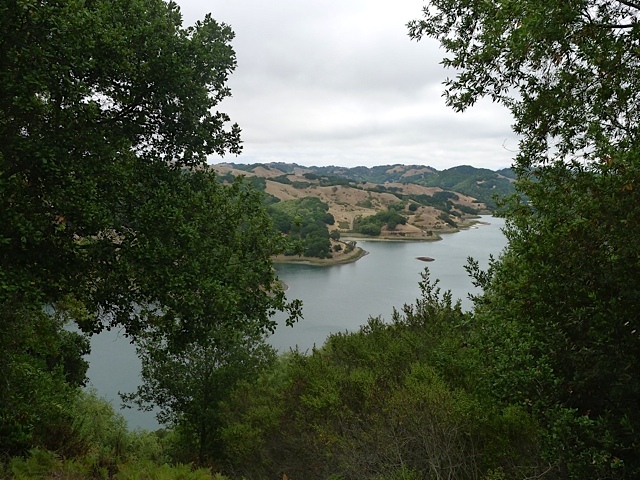 Highlights: The Oursan Trail skirts the northern shores of Briones Reservoir, through open fields and scattered oak trees and is one of the most serene hikes in the East Bay. It is especially stunning in the spring when the meadows are green with wildflowers and the direct sun is welcome. Directions to Bear Creek Trailhead (from Lafayette): From Lafayette take Happy Valley Road up over the hill to Bear Creek Road. Take a right and then a quick left into the Bear Creek Staging Area. 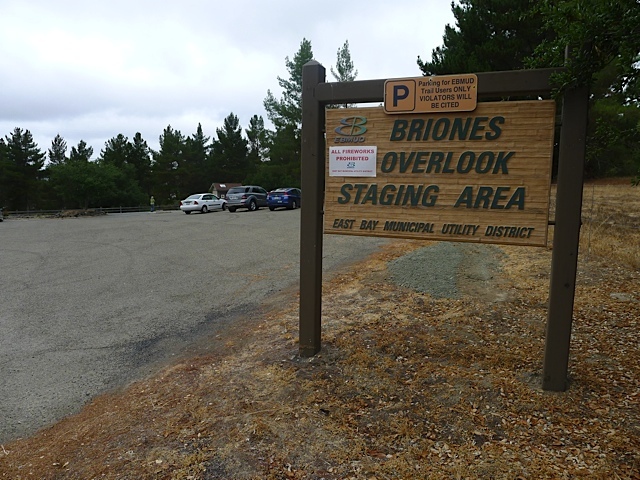 This staging area is on the opposite side of the road from the entrance to Briones Regional Park. Trailhead: Once you have parked look for the gate and trailhead on the right/north side of the parking lot. The Bear Creek Trail starts on the other side. This is the best hike in Lamorinda for walking adjacent to a reservoir besides the Lafayette Reservoir, which is far more crowded. You’ll see a few people on this trail on the weekend, but it is very lightly used. The name “Oursan” is as lightly used as the trail. It means “small bear” in French, but I’m not sure when or why it was chosen. 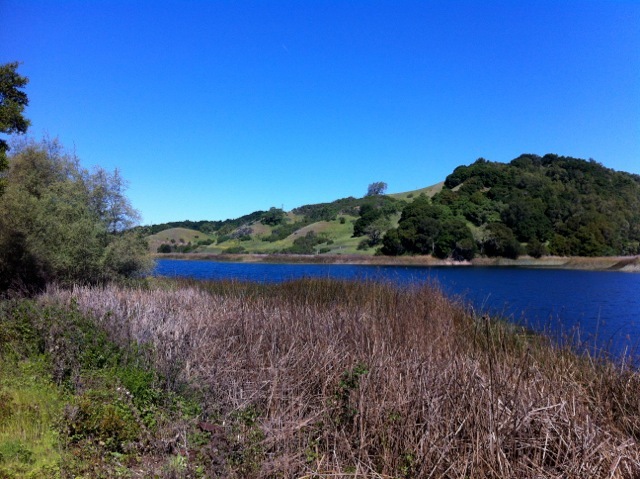 Briones Dam was built in 1964 to supply growing central Contra Costa County with water (that’s us!). 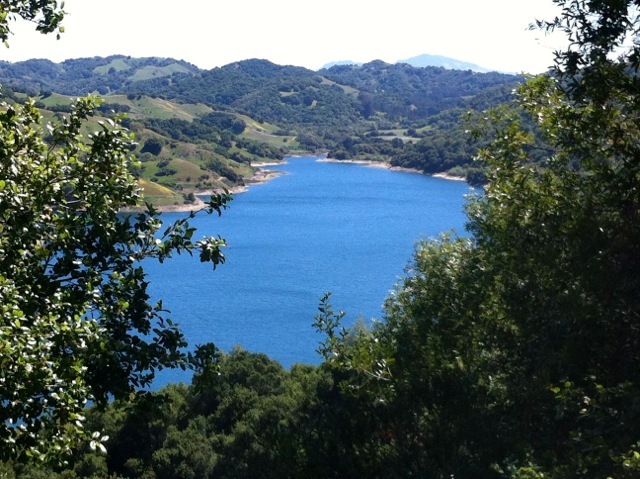 The Reservoir is very deep and the largest of EBMUD’s reservoirs with a total capacity of 19.7 billion gallons of water. 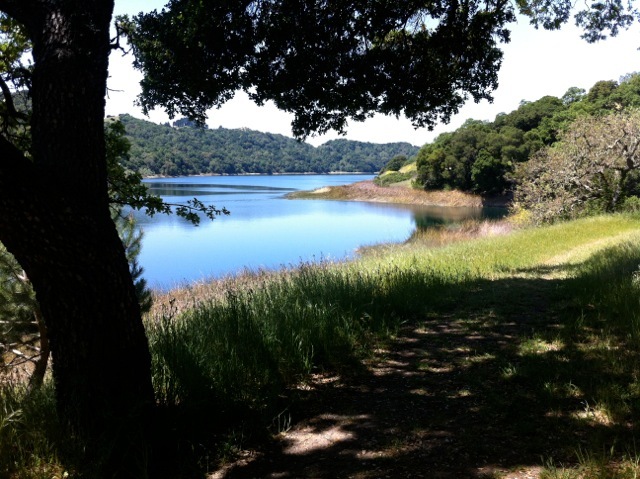 EBMUD manages the reservoir and the watershed land that surrounds it. 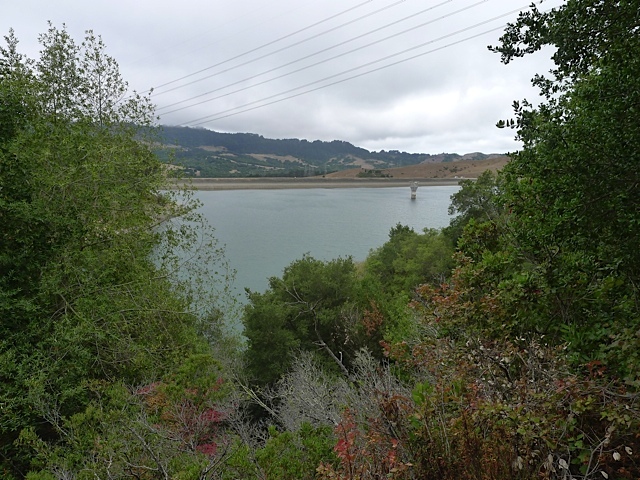 Local runoff into all five reservoirs satisfies about 5% of the East Bay’s water needs. The rest comes from the Pardee Reservoir in the Sierra. To start the hike, go through the gate, sign in at the registration kiosk with your permit number, etc. and then proceed on the fire road. The trail climbs steeply from the trailhead over a small hill, then opens up to a view of the reservoir. First view of the reservoir. You will pass a giant oak on your left with large clumps of mistletoe. We commonly think of mistletoe sprigs as something you hang at Christmas time to kiss under. Mistletoe is actually a very large family of parasitic plants that attach to and penetrate the branches of a tree or shrub, through which they absorb water and nutrients. For a long time, Mistletoe was limited to the foothills around the Central Valley but today it is commonly found throughout the Bay Area and seen in many mature Oak trees in the East Bay. The petals close at night or in cold, windy weather and open again the following morning. Poppy leaves were used medicinally by Native Americans, and the pollen was used cosmetically. It is drought-tolerant, self-seeding, and easy to grow in gardens. Besides poppies, you are likely to see buttercups, lupine, and blue-eyed grass. After passing by the lake’s edge, the trail will take an up-and-down course around two fingers of the lake, often under a canopy of oak trees. You may notice a nest box for wood ducks. In many areas, wood ducks have difficulty finding suitable natural nesting sites. These boxes provide a man-made alternative, where hens can nest in relative safety from predators. Ducks are just one type of bird you might see. In the open areas you may see red-tailed hawks, red-shouldered hawks, or turkey vultures flying high above. In wooded areas you may see varied thrush, western scrub-jays, and band-tailed pigeons. In the water look for ducks and grebes foraging near the shoreline. 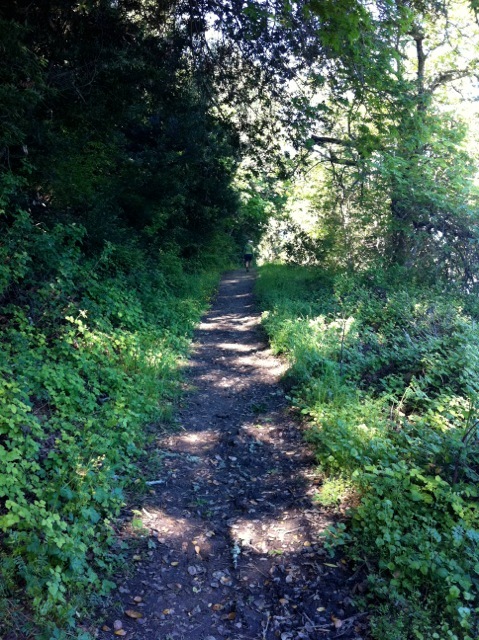 After about a mile, the trail emerges from the trees and runs out in the open, along the water, for another mile or so. You will have many excellent views of the shimmering blue water and may think it would be great for swimming or boating, but it is not open for recreational use. There is one exception: it is used by the Mills College, UC Berkeley and Saint Mary’s College rowing teams, which I’ve seen on one occasion. Keep track of your time and turn around when you have hiked half as long or half as far as you want to go. I typically hike about an hour and then turn around. At 5.4 miles you reach the Hampton Trail, which connects to the Hampton Staging Area. 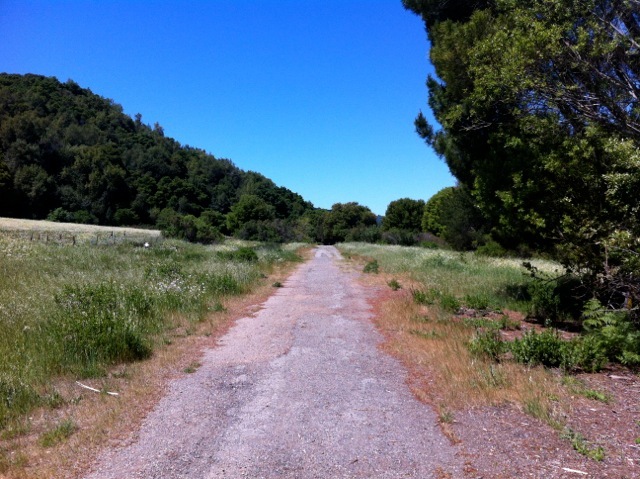 The Oursan Trail actually continues for a lengthy 10.4 miles, ending at San Pablo Dam Road. 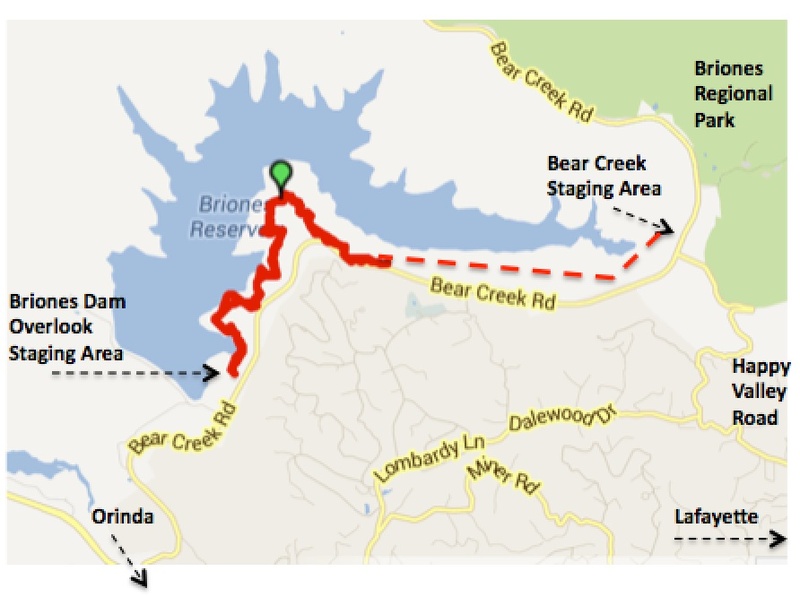 If you’re really up for a multi-hour adventure you can connect to the Bear Creek Trail and complete a 14 mile loop around the entire reservoir. 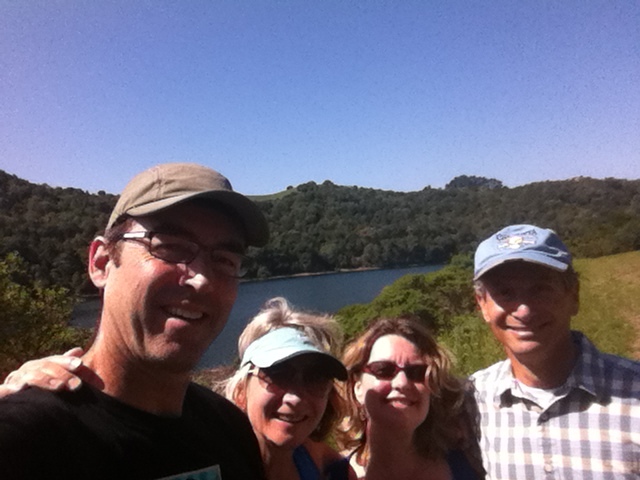 Selfie picture at turnaround point with friends Rick & Alicia! 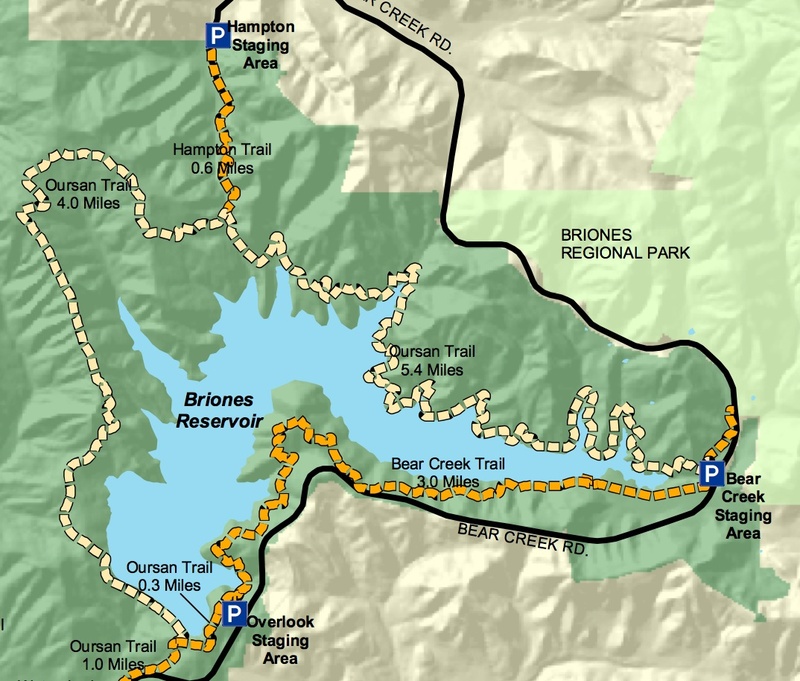 Highlights: This hike in the southeast corner of Briones Regional Park, offers a good workout, sort of like the Rim Trail, with stunning views out towards Mt. Diablo and over Lafayette, and some beautiful forests of oak trees. It’s especially good in the spring when the hills are green. Trailhead: To begin the hike, pass through the gate. Right after going through the gate, you’ll see a sign saying “Future Site of Buckeye Ranch Staging Area.” Apparently this area is the site of a former dude ranch – maybe called “Buckeye Ranch?” I’m not sure when they plan to build a staging area, but it seems OK as it is. There just aren’t any Briones trail maps to grab. Start your hike by veering to the right on the Buckeye Ranch Trail versus going straight up the hill in front of you on the Springhill Trail, which is where you’ll come down. 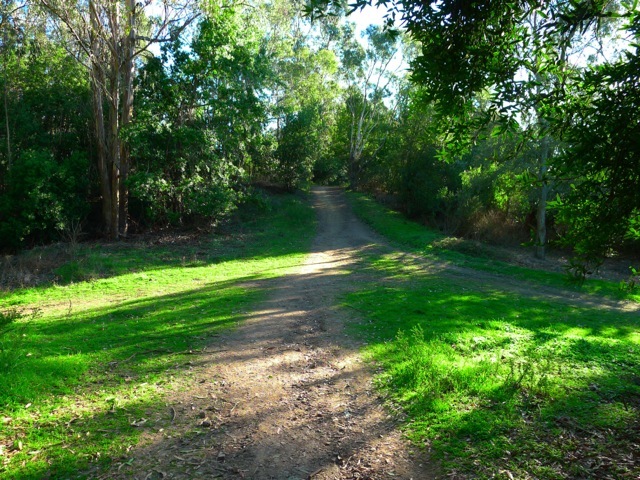 The Buckeye Ranch Trail runs alongside a creek with a pleasant canopy of oak trees. After about a half mile of hiking you’ll reach a gate. Once through the gate, hang a sharp right and follow signs for the Sunrise Trail. Now you’ll be walking back in the same direction on the opposite side of the creek. 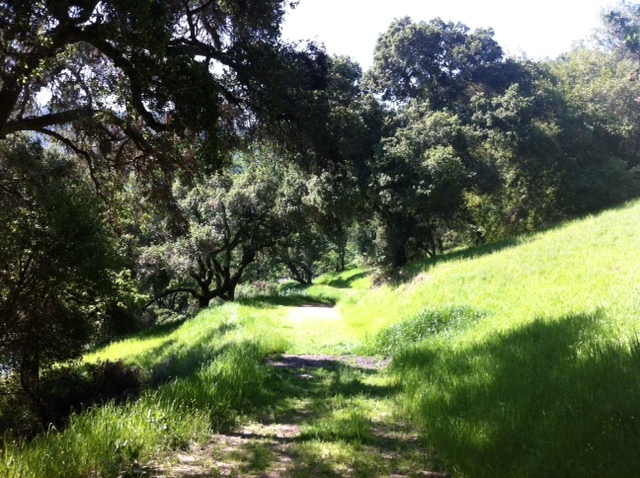 This section is flat and surprisingly scenic – a magical oak forest! 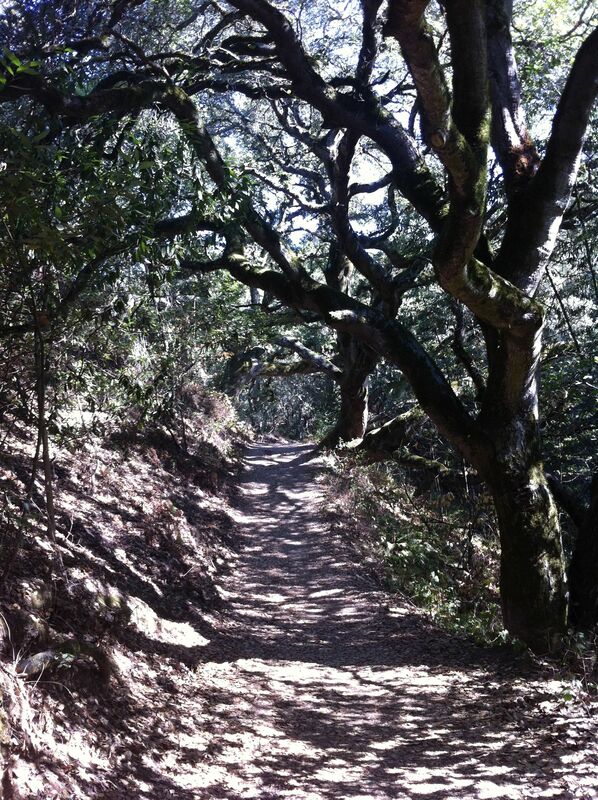 A little about oak trees… Seven species of oak trees comprise most of the oaks you’ll see in the East Bay. These are amazing trees. They have evolved to survive with almost no rain for six months of the year and a mature tree can produce thousands of acorns in a year. But only about 1 out of every 10,000 acorns becomes a tree! Most become food for wild animals. Oak woodlands are one of the richest and most diverse habitats in California, providing a home to over 170 species of birds, 100 mammals, 60 amphibians and reptiles, and 4000 types of insects. Learn more …. After another half mile or so on the opposite side of the creek, you’ll begin to climb, and will emerge from the trees onto the open hillside. You’ll steadily climb about 700 feet over the next mile or so. You may encounter cows on the hill. Just walk widely around them if they are on the trail. Make sure to turn around and enjoy the view out towards Mt. Diablo. 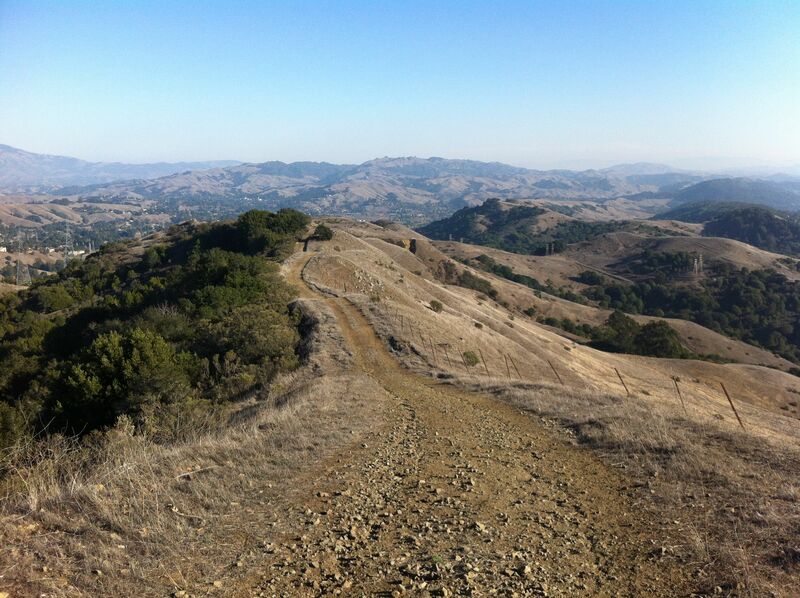 At the top you’ll reach the Briones Crest Trail. Take a left. You’ll pass the Crescent Ridge Trail on your right and then pass the Seaborg Trail on your right. There are many more oaks to enjoy! After a little under a mile you’ll reach the Lafayette Ridge Trail. You’ll take a left here, heading East, but there is an optional add-on if you have the time. OPTIONAL: Continue past the Lafayette Ridge turnoff on the Russell Peak Trail. After about a quarter mile, at the top of a hill, there is a little single-track trail heading up the hill on the left side. This will take you to the top of Russell Peak (1357 feet) where there is a nice large picnic table – a great spot to enjoy a snack and the view. Then return to the Lafayette Ridge Trail. As you head down the Lafayette Ridge Trail you’ll see the trail in the distance following the ridge up and down. It looks sort of like the humps on the back of a camel! The first section is quite steep. 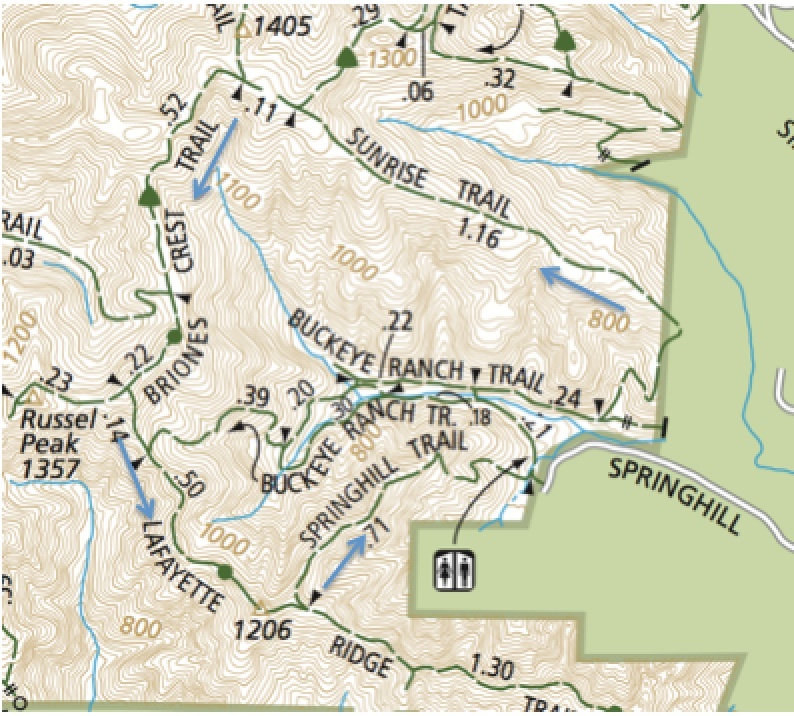 Continue past the Buckeye Ranch Trail and follow the ridge until you reach the Springhill Trail. 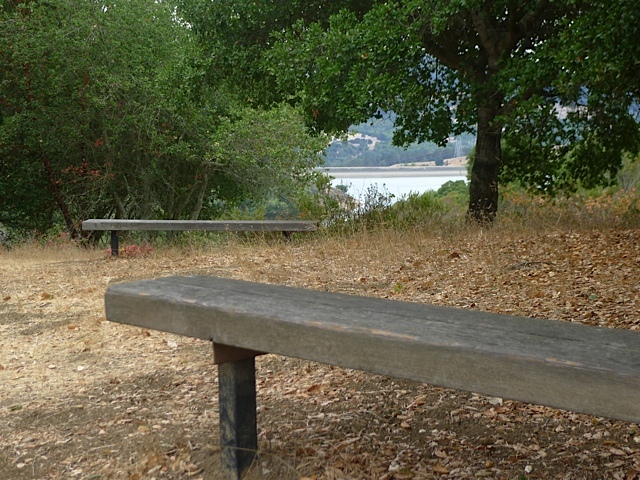 Stop to enjoy views from the Oakland Hills to the sparkling Lafayette Reservoir to Rocky Ridge and Mt. Diablo. An incredible vista! Take a left on the Springhill Trail and follow it back down to the staging area. There are a couple of steep sections so be careful. It helps to wear hiking shoes with grippy soles. You can do this loop in either direction, but climbing up Sunrise is more of a steady and manageable incline than going up the Springhill Trail. Bring plenty of water and protection from the sun! Highlights: This was my first favorite hike in the Lamorinda area and my kids used to call it the Ladybug hike since they found a bazillion ladybugs! Start in Canyon at the former site of “Eastport” and hike up a scenic, wooded canyon to Sibley Volcanic Preserve (reaching 1600 feet), hike around Round Top, and descend back the way you came. This is a great year-round hike – a manageable amount of mud in the winter and a good dose of shade in the summer. Directions: Drive to Moraga and then go south on Canyon Road, which ends at Pinehurst Road. Go right on Pinehurst Road. You will pass through the tiny town of Canyon. It’s fun to remember that a train used to run through this canyon. 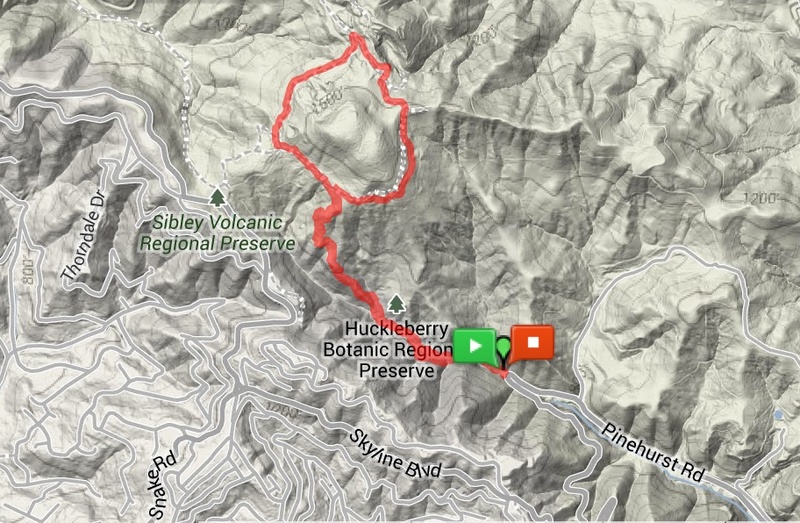 After a little over two miles you will reach a hairpin turn with a fire road gate. Park there. Special Notes: Sibley allows dogs off leash away from the parking lot, so you’ll likely run into hikers with dogs on the Round Top loop. A couple hundred yards before reaching the hairpin turn, you will pass the spot (on the left side) where the Sacramento Northern Railroad used to go through a tunnel between Canyon and Sheperd’s Canyon (on the Oakland side). The Sacramento Northern Railroad was an electric train that ran 183 miles from Oakland all the way to Chico. The first stop on the East side of the tunnel was called Eastport (the eastern portal). Eastport still shows up in Wikipedia and on Google Maps! After parking at the hairpin turn, begin your hike by walking past the gate. 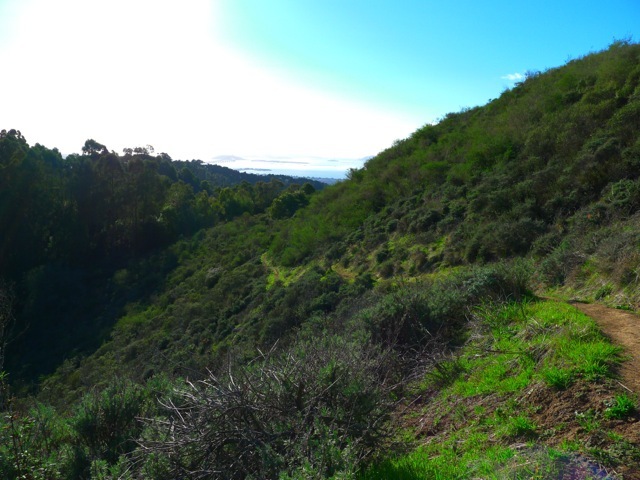 After about a quarter mile, and a short climb, you will reach the Skyline National Recreation Trail, which runs for 32 miles through the East Bay Hills and is part of the Bay Area Ridge Trail. 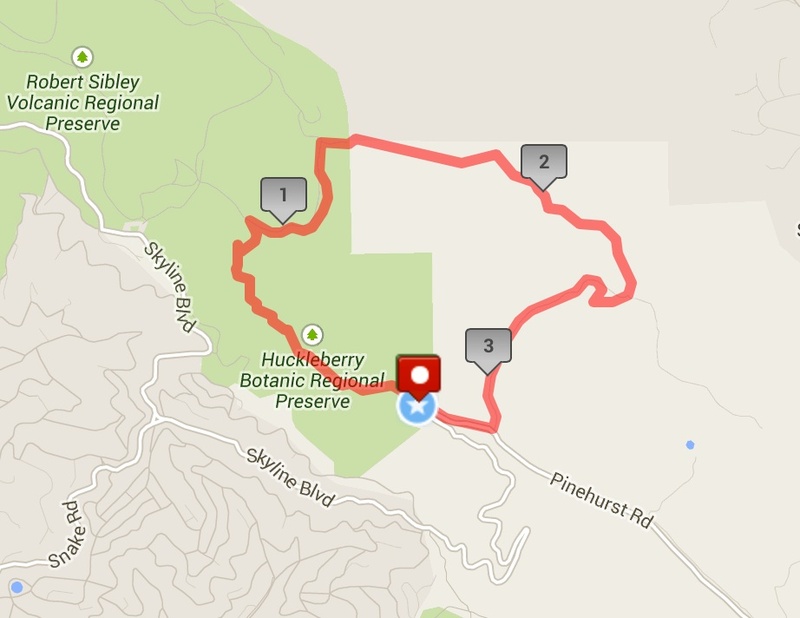 Going left will take you to Huckleberry Preserve. Going right will take you towards Sibley Volcanic Preserve. Go right. Right away you will cross the San Leandro Creek, which begins near Sibley and continues for an amazing 21.7 miles through San Leandro Reservoir, Lake Chabot and then out to the Bay near the Oakland Airport. 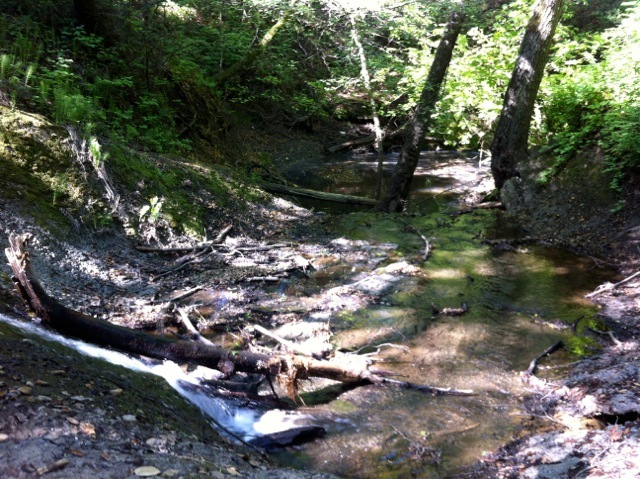 This is one of the few places in the Lamorinda area where you can hike next to a running creek. Climbing up the ridge to Sibley. 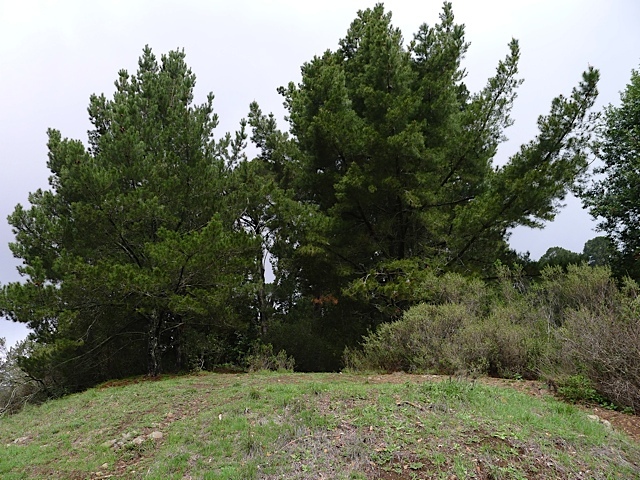 After following the creek for a little ways, the trail will begin climbing up a ridge, and eventually reach a little, open grassy area with pine trees behind it (see picture). This is a great spot to catch your breath, turn around, and enjoy an amazing view. 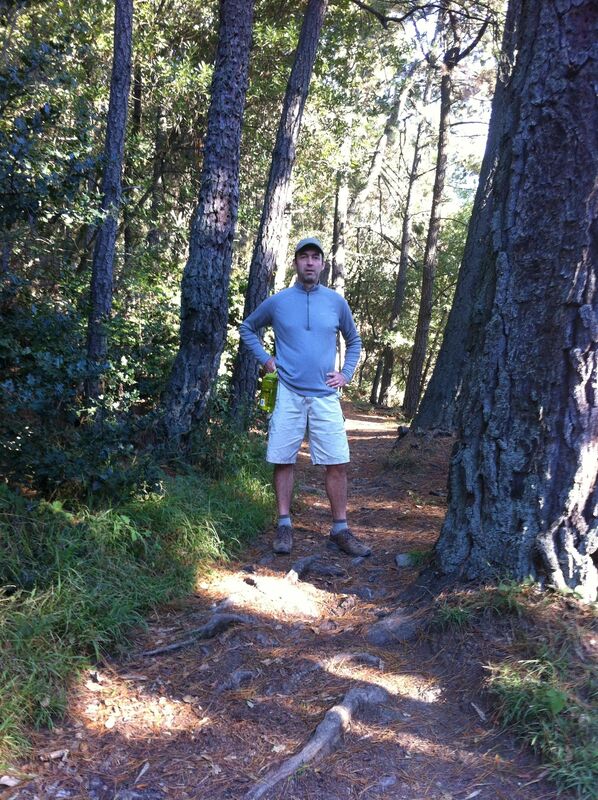 Continue through the grove of Monterey pine trees. After about 25 minutes of hiking and just a hair over one mile you will reach a junction with the Round Top Loop Trail. 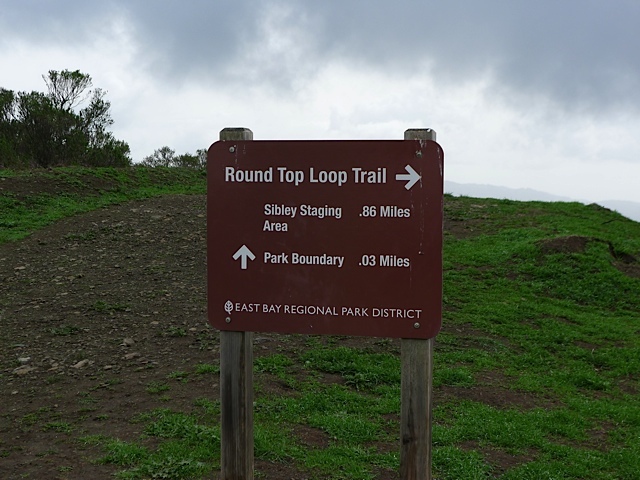 This trail circles around Round Top, the central feature of Sibley Volcanic Regional Preserve, and one of the highest peaks in the area at 1763 feet. Take a right. 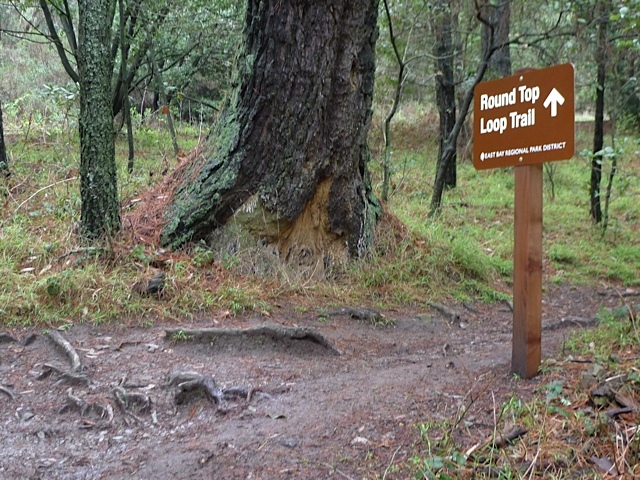 You will be following the Round Top Loop Trail for about a mile all the way around Round Top. It’s pretty cool that we have a 10 million year old volcano in our back yard! It features a complex volcanic center that was the source of most of the lavas that underlie the ridges from Inspiration Point in Tilden Regional Park to Moraga. Tectonic forces on the Hayward and Moraga earthquake faults have uplifted the Berkeley hills and tilted the Round Top volcano complex on its side. So, under the grassy cover, its guts are exposed, and a self-guided brochure is available highlighting visible geological features. 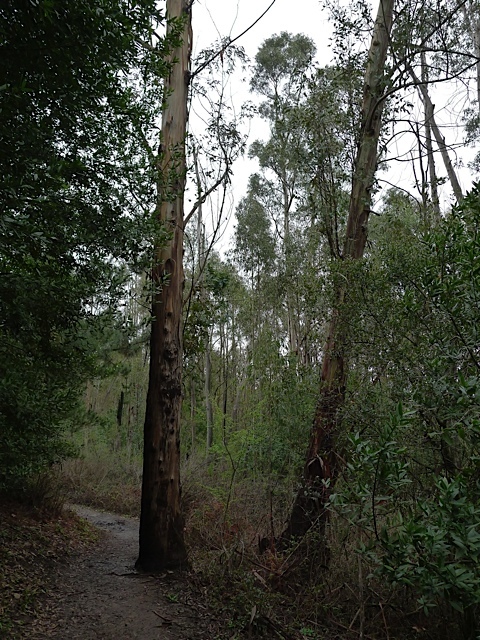 In the next section of the hike there are many, many eucalyptus trees. They have become such a familiar sight in California that many people probably don’t realize that they are really transplants from Australia. Almost all of the 600-plus species of Eucalyptus are native to Australia, where they are the dominant plants in a number of different habitats. 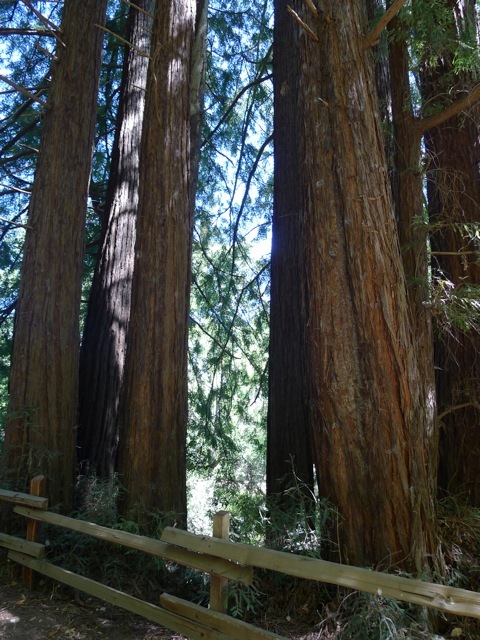 They are some of the tallest trees in the world and extremely drought tolerant. After going through a cow gate, you will a junction, with a fire road heading off to the right. For this hike you want to stay left. Taking a right will lead you into a “land banked” area that is not open to the public yet. Read more about this at the end of the article. Continue past the viewpoint and then take a left to stay on the Round Top Loop Trail. After going through another cow gate, you’ll reach a junction, where you’ll see a small sign on your left that says “Geologic Marker #1.” Hang a left at that point. The Round Top Loop Trail continues across the paved road leading up the hill. In a quarter mile or so you’ll cross over a road and reach the junction where you started on the Round Top Loop Trail. Continue straight and descend back down the canyon the way you came. Shortly you will reach a fire road gate that borders the land-banked area. This land-banked area will eventually be developed and added to the Sibley Preserve. If you continue on this fire road it will take you down a ridge with incredible views out towards Moraga and Mt. Diablo. Stay right and you’ll eventually reach a junction with two large power line towers. Take a right. You’re now on the main road that led out of Eastport, off of Pinehurst Road. As you near Pinehurst Road you’ll see old foundations and other remnants from the days when Eastport was an important train stop and small unincorporated town. When you reach Pinehurst Road, take a right and walk along the side of the road back to your car. You’ll walk right by the spot where the tunnel was! Check out pictures of Eastport back in the 50’s. Elevation Gain: There is a little climbing on the way back. 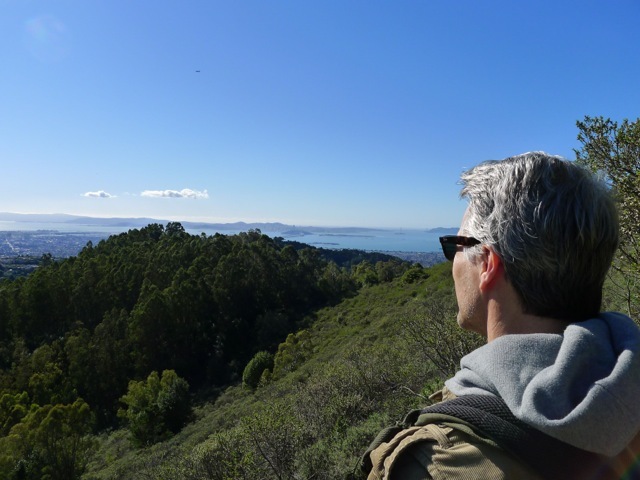 Highlights: This is a great short hike to an amazing viewpoint in the Berkeley hills that looks out over Berkeley, Oakland and the whole northern bay. 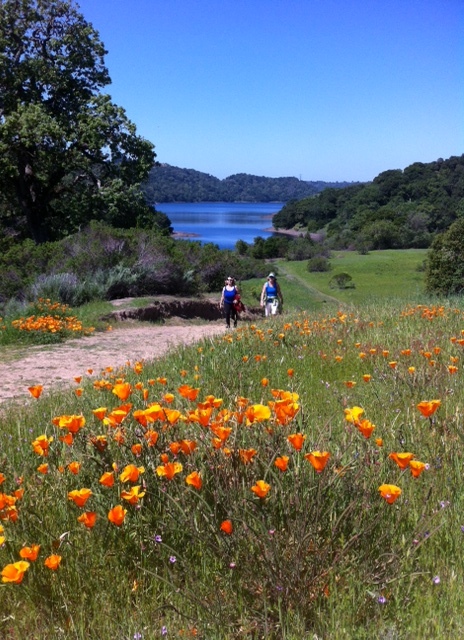 It’s a great hike to take out-of-town visitors on, and it can be done or your way to or from Oakland/Berkeley. Directions to Trailhead: Take Highway 24 west to Fish Ranch Road (last exit before the Caldecott tunnel). Go right on Fish Ranch Road. When you reach a four-way intersection take a right on Grizzly Peak Blvd. Drive about 8/10th of a mile. When you see logs along the left side of the road and a fire road gate on the right, park on the right side. 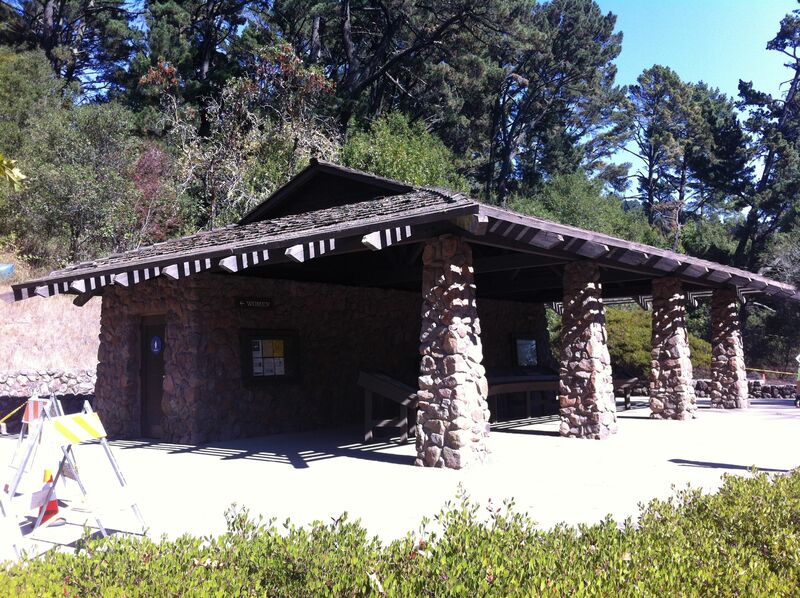 This trailhead is called the Scotts Peak Trailhead and is less than 10 minutes from downtown Orinda! Special Notes: This hike is best on a clear day with good visibility. Nearby Grizzly Peak (1759 feet), up past the Tilden Steam Train, was named for the California grizzly bear, which inhabited the local area until sometime in the late 1800s. The last grizzly in all of California was killed in the Sierra foothills east of Fresno in August 1922. After parking you’ll see a small trail across the street that goes over one of the big logs (see picture). This unmarked trail is called the Side Hill Trail. And after a couple minutes you will be on the side of a hill (get it?) with truly jaw-dropping views of San Francisco and the Golden Gate Bridge. Down to the immediate left is Telegraph Canyon, which feeds into Claremont Canyon. Take your time and enjoy the views! 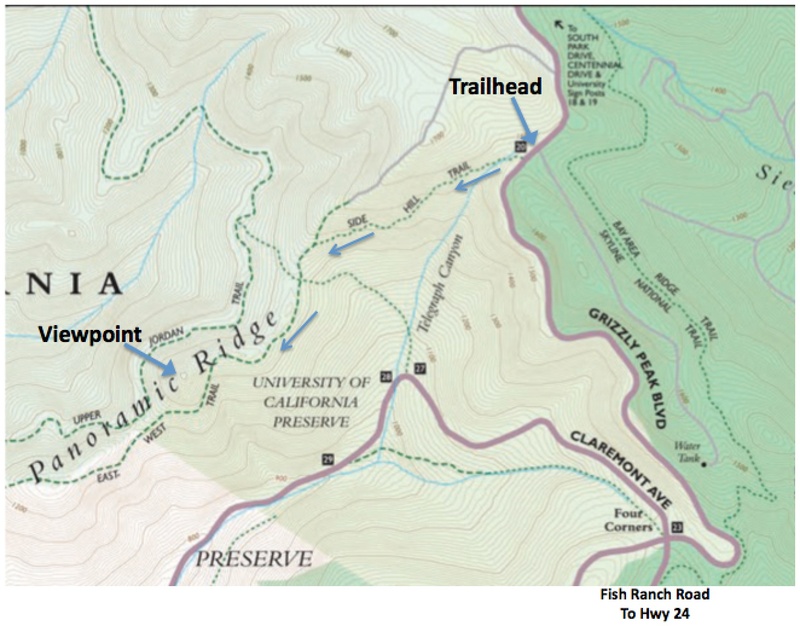 The land and trail that you’re hiking on is part of the University of California Preserve (map). After 10 minutes or so on this single-track trail, you’ll emerge onto a fire road. Remember this spot, because when you’re on your way back, it’s easy to walk right by this small trail. Take a left going downhill. Right away you’ll reach a four-way junction (see picture). Going right will take you on a pleasant, flat fire road that ends at the U.C. Campus (near the Lawrence Hall of Science), and is popular with student joggers. 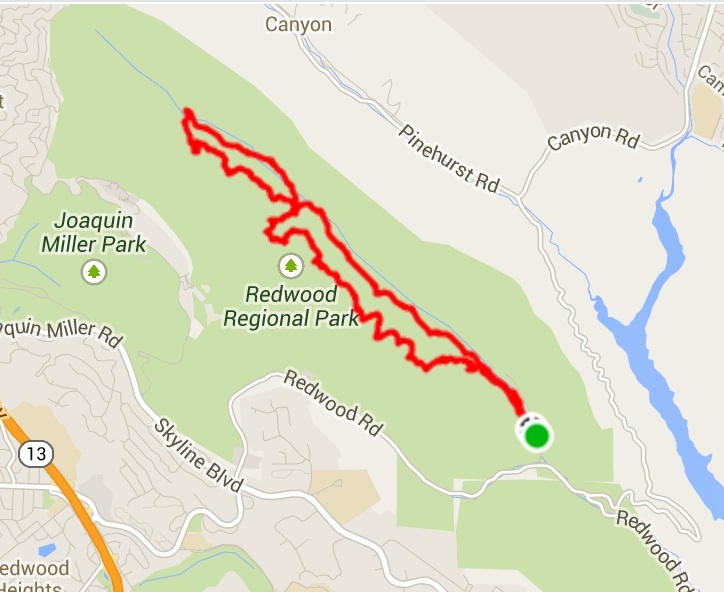 Going left will take you on the Claremont Trail, which descends down into Claremont Canyon. For this hike just go straight through the intersection on what’s called the East-West Trail. You’ll be walking on Panoramic Ridge and boy is it panoramic! Four-way junction. Go straight across. Little side trail to the lookout on the right side. After just a couple minutes you’ll see a little hill in front of you with a small trail on the right side (see picture). Take that trail out to an amazing viewpoint!! It’s a great place to bring a snack or lunch. But the only place to sit is on the ground and there is no shade. So prepare accordingly. 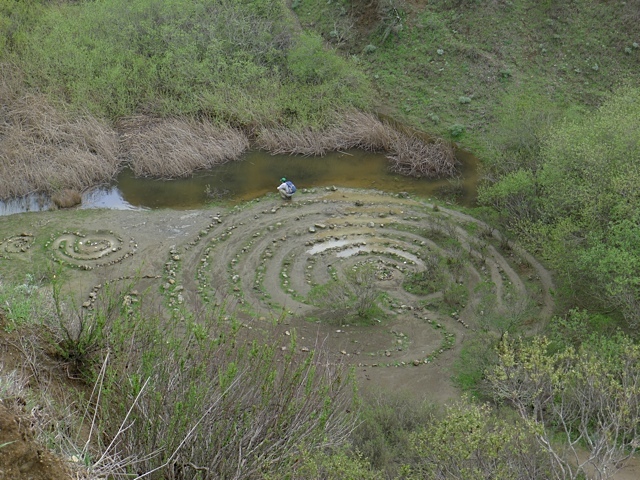 There is a little labyrinth that kids will enjoy. Enjoying the views at the lookout! After you are done enjoying the amazing view, head back exactly the way you came. One fun idea, that I’ve done once, is to hike all the way down to the Claremont Hotel area for lunch and then hike back up to your car, parked on Grizzly Peak Blvd., after lunch. Claremont Canyon, down the hill to the south of this hike, has an interesting history. In 1858 a transcontinental telegraph line that linked the west and east coasts was strung through the canyon and in the early 1860s Pony Express riders carried mail along this route. It then became the main “highway” for horse and wagon traffic between Oakland and Contra Costa County. The intersection of Grizzly Peak Blvd and Fish Ranch Road was an important pass and had an inn and stage stop called the Summit House located there. 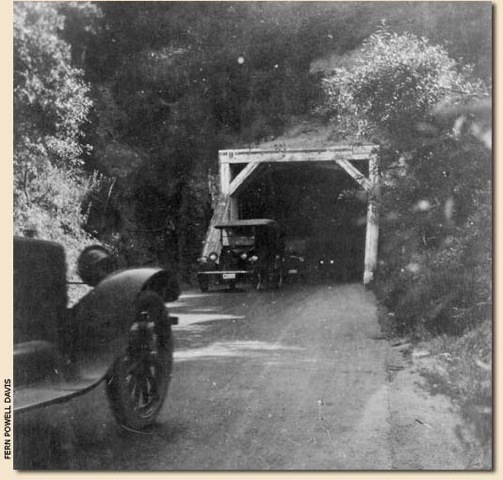 Travel through the canyon declined after 1903 with the opening of the Kennedy Tunnel, which preceded today’s Caldecott Tunnel. Elevation Gain: About 350 feet of gain from trailhead to Sibley Staging Area. Dogs: Yes! Dogs are supposed to be leashed on the Skyline Trail until reaching the Sibley Staging Area and then can be off leash in Sibley, away from the parking lot. You will typically see many happy dogs in the park! 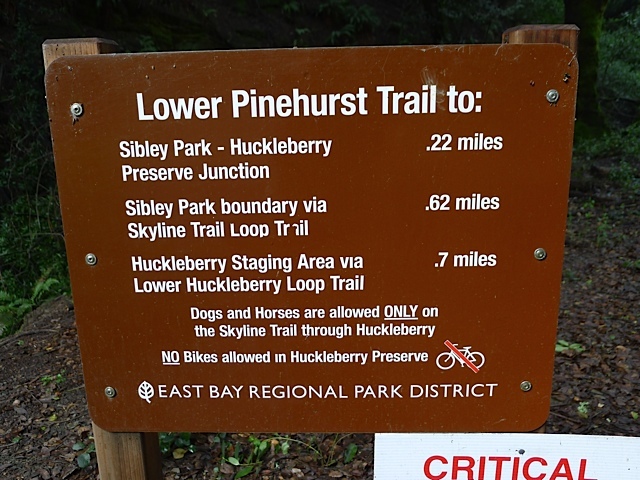 Highlights: This is the fastest way to reach the 32-mile East Bay National Skyline Trail from Lamorinda, and an interesting and scenic way to access Sibley Volcanic Preserve. Directions: Take Highway 24 west towards Oakland. Before going through the tunnel, exit on Fish Ranch Road. At the stop sign, take a left across the highway and then take a right on Old Tunnel Road. After about a quarter of a mile you’ll see a parking area. Trailhead: The new parking lot is at the bottom of Old Quarry Road, but you want to get on the Skyline Trail going south towards Sibley (look for sign shown below). You can take it in the other direction to reach Tilden Regional Park. 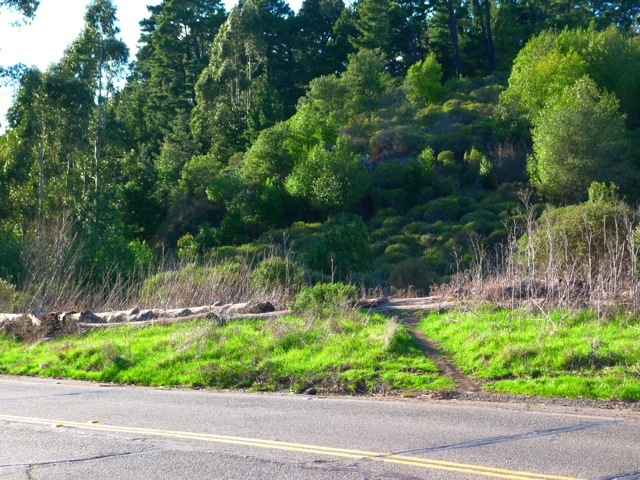 When you first take a right on Old Tunnel Road, it’s fun to remember that this small road used to lead to the old tunnel that was 220 feet above the current Caldecott Tunnel. It was called The Broadway Tunnel, Kennedy Tunnel, and Inter-County Tunnel. After surviving protests from Lafayette residents that thought it would increase competition for land, the old tunnel opened in 1904. It was 1.040 feet long, 17 feet wide and lined with timber. Long, dark and narrow, the tunnel could only accommodate one-way traffic.. Wagon drivers lit up newspapers when entering as a signal to those at the other end to wait. In 1915 the ceiling was raised three feet to accommodate cars and trucks. In 1937, when the old tunnel was retired, it was handling 30,000 cars per week. Today the Caldecott handles 160,000 cars daily! After you park you’ll see the signs for the Skyline Trail. 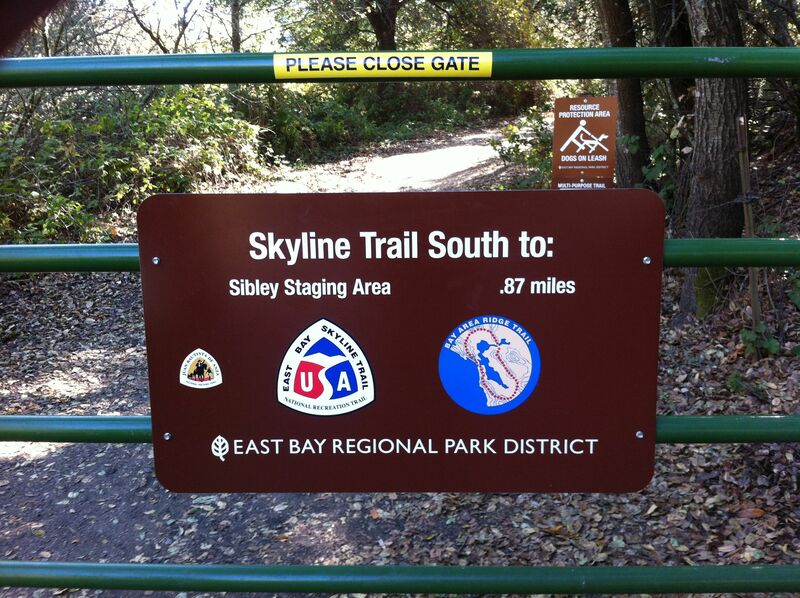 The 32-mile East Bay Skyline National Recreation Trail goes through six different parks and preserves. 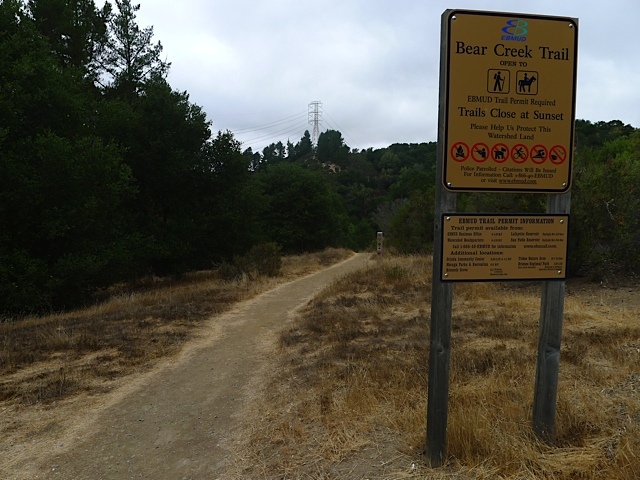 The trail begins at the entrance to Wildcat Canyon Regional Park in Richmond and leads through Tilden Regional Park, Sibley Volcanic Regional Preserve, Huckleberry Botanic Regional Preserve, Redwood Regional Park and Anthony Chabot Regional Park. 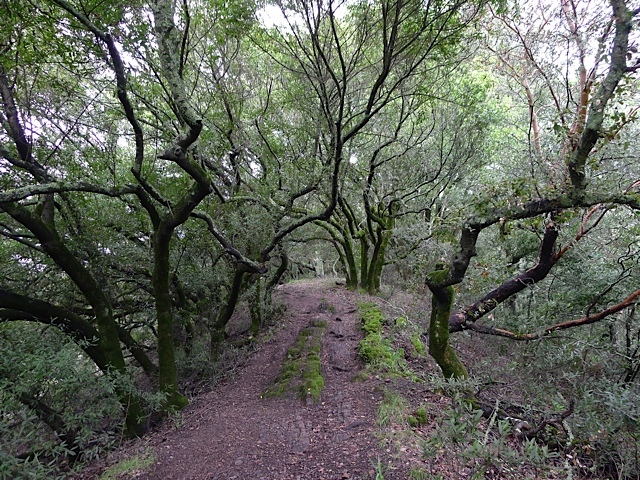 It is part of the larger 550 mile Bay Area Ridge Trail that circles the entire Bay Area. 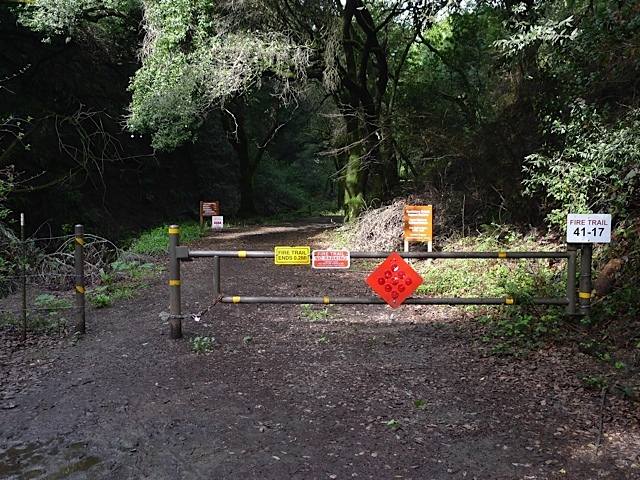 To start the hike, go through the gate (shown in picture) with signs pointing the way to Sibley Volcanic Preserve. Right away you will see a sign explaining how the Caldecott Wildlife Corridor provides an important path for animals to move between parklands on the south and north sides of Highway 24. They certainly don’t stand much chance trying to sprint across the highway! You will begin a steady, gradual climb through the wooded canyon adjacent to Round Top Creek, which is dry in the summer. Many of the trees are California Bay Laurel Trees. 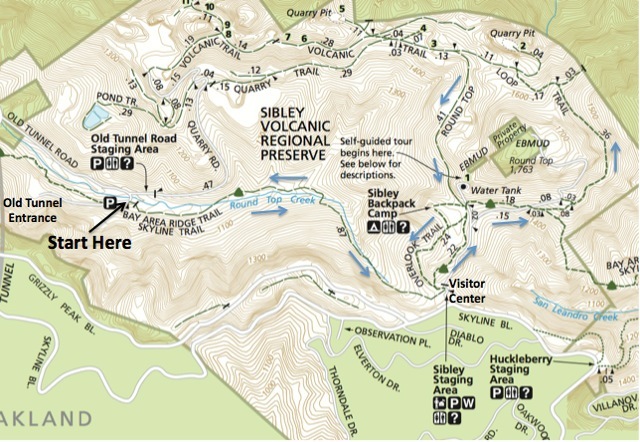 After about 9/10ths of a mile you will reach the parking lot and visitor center for the Sibley Volcanic Preserve. 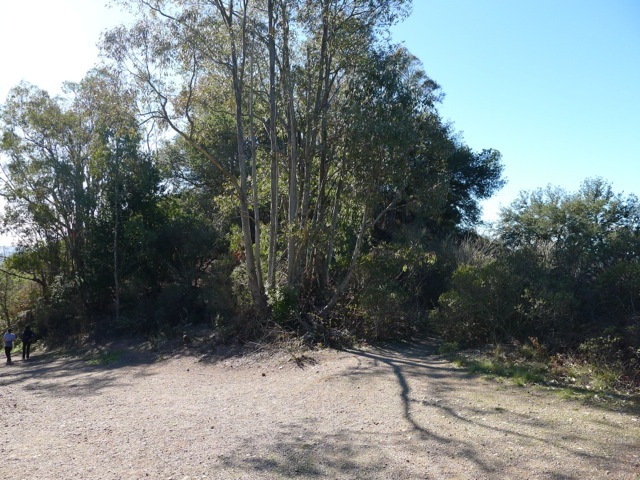 The park is named in honor of Robert Sibley, who helped found the East Bay Regional Park District and served for 10 years on its board of directors. This is a good chance to use the bathrooms, get a drink, and check out the unstaffed outdoor visitor center that has interesting displays illustrating the preserve’s geology. It’s pretty cool that we have a 10 million year old volcano in our back yard! 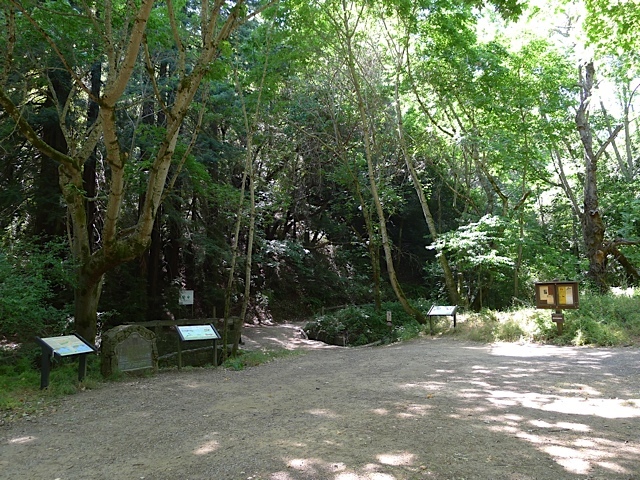 It features a complex volcanic center that was the source of most of the lavas that underlie the ridges from Inspiration Point in Tilden Regional Park to Moraga. Since the volcano’s active days, tectonic forces on the Hayward and Moraga earthquake faults have uplifted the Berkeley hills and tilted the Round Top volcano complex on its side. So, under the grassy cover, its guts are exposed, and a self-guided brochure is available highlighting visible geological features. Backtrack to where the Skyline Trail continues into the trees, on the south side of the visitor center. After about a quarter mile you’ll reach an intersection of trails. Look across to the other side of the road and you’ll see a post showing where the Skyline Trail continues. After another fifth of a mile, you’ll intersect the road that leads up to Round Top, one of the highest peaks in the area at 1763 feet. Cross the road and then take the Round Top Trail to the left. 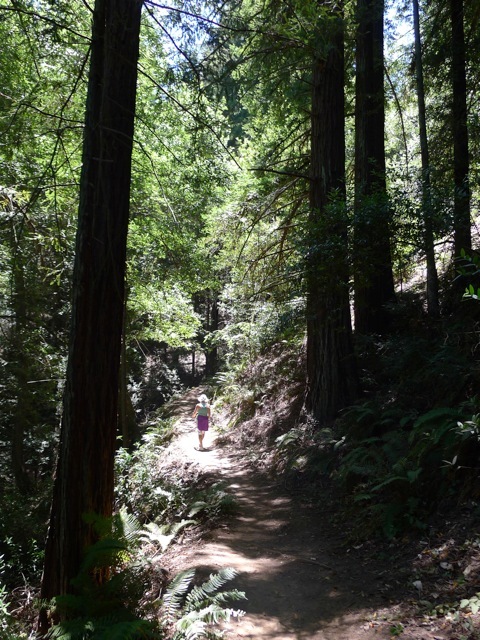 The Skyline Trail continues to Huckleberry Preserve and then Redwood Regional Park. Continue past the viewpoint and then take a left to stay on the Round Top Trail. After going through a gate, you’ll reach the junction again. Take the Scenic Overlook Trail on the right. This will take you back to the visitor area, where you can rejoin the Skyline Trail and follow it back down to where you parked.